If we want a more democratic society, we need more democratic schools. The history of schools in the United States is, in many respects, a tale of struggle over equality and opportunity. In a society defined by stark social inequalities, schools are expected to “level the playing field,” promote social mobility, and cultivate societal cohesion. Yet public education in America has long been more than just a tool of socioeconomic intervention. Reformers and public officials have prized schools equally as seedbeds of democracy. Schools have been called upon to create a more competent, engaged citizenry, foster a more egalitarian political order, and act as local sites of democratic public engagement. With the right kinds of educational experiences, reformers have argued, even the most socially disadvantaged youth could develop the skills and dispositions needed to become part of an inclusive, enlightened citizenry. But what if we’ve organized our schools in ways that actually undermine democratic aims? People learn a range of lessons from their experiences with public authorities and institutions. At the welfare office, clients discover that “when dealing with state bureaucracies they have to patiently comply with the seemingly arbitrary, ambiguous, and always changing state requirements.” Through aggressive policing, citizens receive a crash course in how state power operates and what citizenship entails for those at the lower reaches of the social order. So too with public education. At school, young people have their first formative experiences of public authority. They are immersed in rules and prohibitions, and are visibly governed as members of a community of putative equals. On matters small and large, they seek actions from teachers and administrators and observe how they respond. They are rewarded or punished for their behaviors, and subjected to modes of authority that may be fairly and legitimately deployed or wielded in an arbitrary and unjust manner. So are students — particularly those on the bottom rungs of society — being prepared for a life of democratic citizenship, or being taught that they’re a threat to be managed? We set out to explore how students’ race, gender, and class positions shape their experiences in school — and how those experiences in turn shape their future political behavior and political views (measured by electoral participation and trust in government). Drawing on data from the National Longitudinal Study of Adolescent to Adult Health (Add Health), we began by asking how school experiences vary across student racial identification. The figure below shows mean differences for whites, blacks, and Latinos. 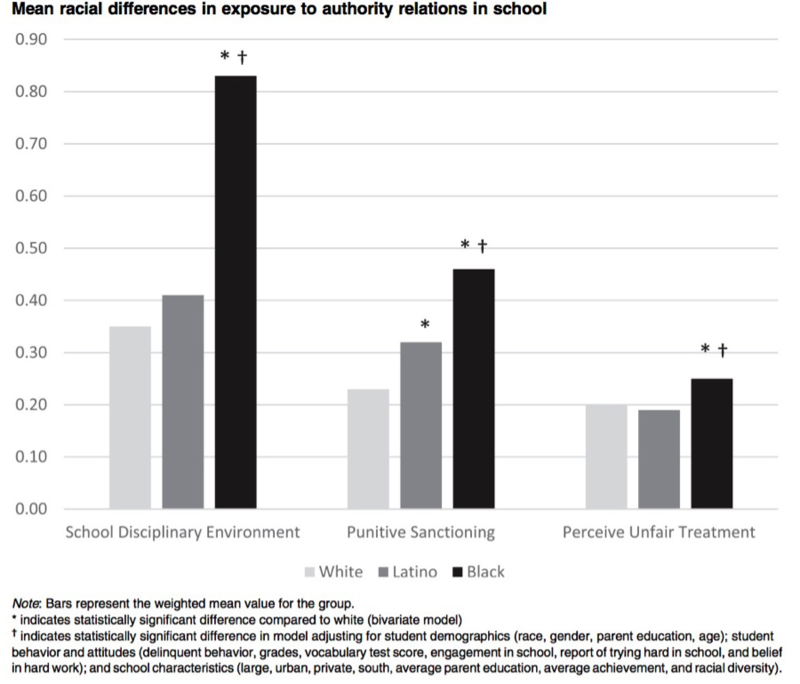 Across all three measures, black and Latino students are more likely than their white peers to have negative experiences of school authority, in most cases even after accounting for all student and school controls. Black students are dramatically more likely to attend schools that pursue surveillance and monitoring more aggressively and make more extensive use of suspensions and expulsions. A remarkable 83 percent of black youth attend such schools, compared to 41 percent of Latino youth and 35 percent of white youth. At the individual level, black students are also substantially more likely to be targeted for these sanctions. White students are suspended or expelled least often (23 percent), with Latino students punished at a somewhat higher rate (32 percent). By contrast, 46 percent of black students receive suspensions or expulsions — double their white counterparts. These disproportionate levels of punitiveness — particularly for black males — remain even after controlling for misbehavior and teacher-rated behavior problems. Subjective perceptions of fairness exhibit a less pronounced but still racialized distribution. Consistent with other research, black students are significantly more likely than Latino and white pupils to believe that teachers treat students unfairly (25, 19, and 20 percent, respectively). To consider race alone, however, is to obscure how multiple axes of social differentiation and power intersect to shape school experiences. 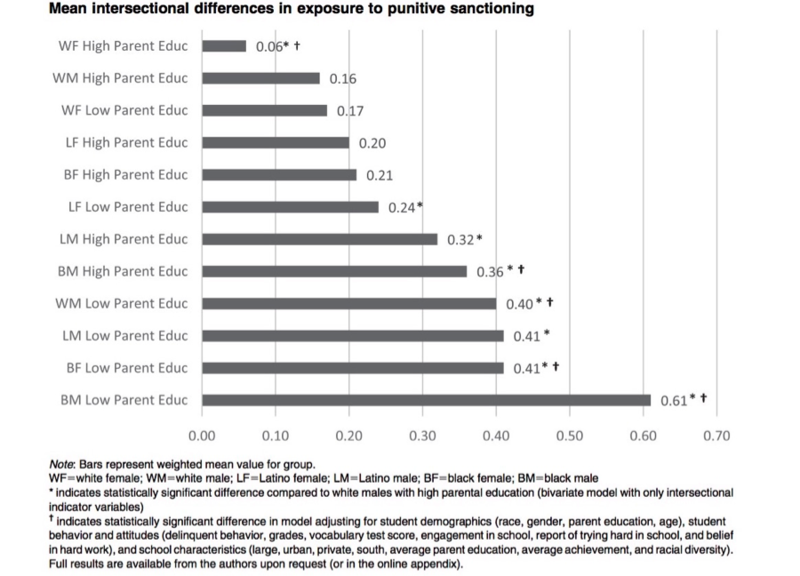 The next figure shows how school suspension and expulsion rates vary across specific combinations of race, gender, and class (measured here by parental education as a marker of socioeconomic status [SES]). School authorities punish male students far more often than female students. Of the twelve rates shown, five of the lowest six are for females. Yet while males are generally penalized more often, this gender effect evaporates if the males in question are white and come from a higher-SES family. Positioned as a strong, “gender immune” outlier, high-SES white males experience the second-lowest rate of punishment for any group, higher only than high-SES white females. Parental education effects are similarly conditional. Four of the five lowest rates of punishment are observed for high-SES students (ranging from 6 to 21 percent), while the four highest rates are seen for low-SES students (ranging from 40 to 61 percent). 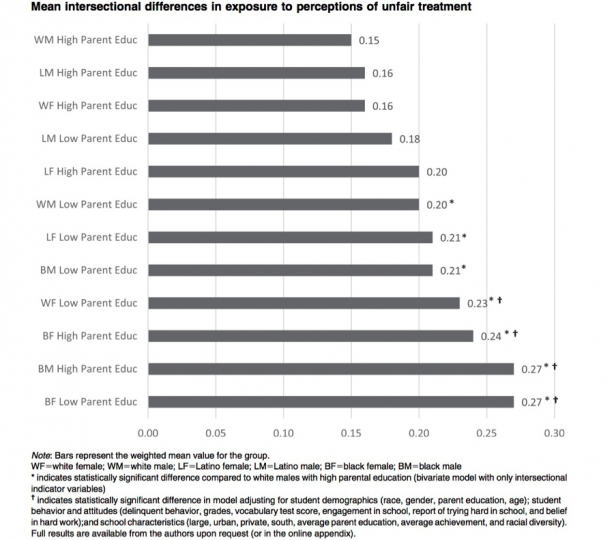 The punishment-dampening effects of parental education do not provide nearly as much relief for black males: even when they have highly educated parents, black males get suspended and expelled at a notably elevated clip of 36 percent (fifth-highest among all groups). Returning to racial differences, we find that white students (the three lowest rates) and black students (the two highest rates) anchor the poles of the distribution, with Latino students spread across the mid-range. The most striking result, though, can be seen in the outsized targeting of black males from low-SES families. Between grades seven and twelve, 61 percent of these students are suspended or expelled by school authorities. A number of comparisons underscore this extraordinary disparity. The punishment rate for low-SES black males is 49 percent higher than even its nearest counterpart (41 percent, for low-SES black females) and 917 percent higher than the lowest group rate observed (6 percent, for high-SES white females). Poor black males clearly catch the brunt of punishment in American schools. Turning to perceptions of fairness, we see a strongly gendered pattern. Female students make up three of the four groups most likely to believe authority is used unfairly, while male students produce the two lowest rates. In addition, for each race-gender combination, students from low-SES families are more likely to perceive unfair treatment than their high-SES counterparts (with black males as the one exception). For example, 23 percent of white females from low-SES families perceive unfair treatment in school compared to 16 percent of white females from high-SES families. This gap is crucial. In regression models that controlled for a variety of alternative influences, we found that institutional environments — such as school disciplinary regimes — actually mattered less for future political engagement than personally being suspended/expelled or believing that teachers treat students unfairly. The latter two experiences were consistently associated with both lack of trust in government and depressed political participation, while the measure of school disciplinary environments generated small differences. The objective experience of being singled out for punishment consistently lowered the odds of voting and trusting government (by 19 and 21 percent, respectively); the subjective perception of unfair treatment lowered the odds of voting by 14 percent and the odds of trusting government by 28 percent. Consistent with previous evidence that experience-based perceptions of bureaucratic fairness tend to influence broader assessments of government, these results suggest that young adults may carry their school-based evaluations of authority with them into young adulthood and generalize them to government as a whole. After all, if the most significant face of government you see as a young student is a capricious school resource officer, then what can you expect from the state as an adult other than more punishment? “It is inevitable that we live within constructed and formative institutions,” Stephen Macedo and his colleagues write; “there is no alternative.” A perennial task for those who value democracy, then, is to interrogate how our institutions operate in politically formative ways, for whom, and to what effect. Few observers today would disagree that schools “make citizens” — and advantage some citizens over others — by distributing political knowledge and politically consequential skills, resources, and opportunities in unequal ways. But our findings raise troubling questions about educational institutions’ ability to blunt the effects of social inequalities on American democracy. Schools appear to operate as instruments of entrenchment, converting social hierarchies into predictable patterns of political inequality and civic marginalization. These troubling political dynamics are rendered invisible in political analyses that focus narrowly on educational attainment, just as they remain obscured in educational debates that privilege test scores and other indicators of whether students “get what they should” from school curricula. [T]here may be unintended negative repercussions from the use of suspension and expulsion as a tool for promoting school safety . . . Much like the case for adult punishment, the [negative] collateral consequences of policies and practices designed to promote school safety need to be weighed against the potential benefits. Like John Dewey before us, and like contemporaries such as Benjamin Justice and Tracey Meares, we find compelling reasons to believe that democratizing American society will depend, at least in part, on efforts to make schools more just and democratic in their own right. An obvious first step would be to scale back schools’ heavy reliance on policing and authority relations that yield criminalization. 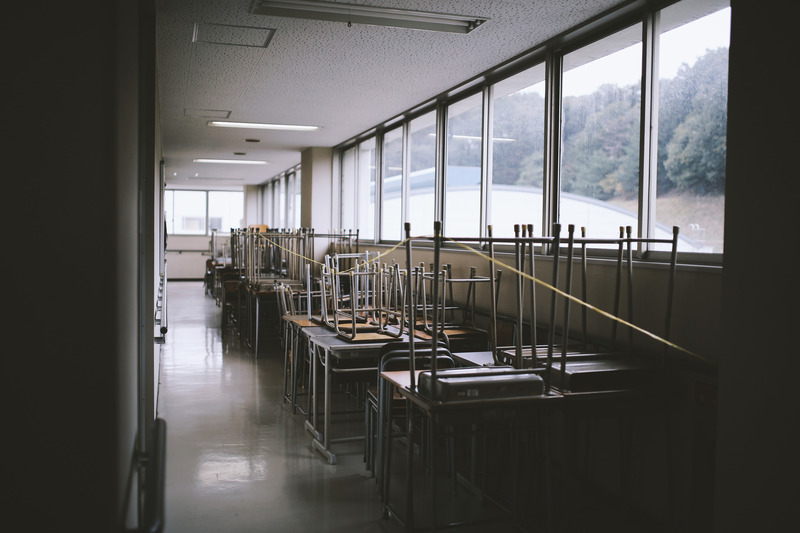 Reforms should seek to reduce disproportionalities in the terms and targeting of school discipline, and do so in ways that are mindful of how class, race, and gender structure school experiences. School roles could be defined in a more explicitly civic manner, with students given more opportunities to solve problems collaboratively (with peers and authority figures) and to participate in consequential decision-making processes. Rather than defining and imposing a “positive school culture,” school authorities might call on students to grapple with (and thus, experience firsthand) the challenges of fostering equal respect in a way that builds solidarity while valuing social diversity. Efforts to shift from punishing violations to repairing harms (what are often called “restorative justice” approaches) strike us as particularly promising. But ultimately they must be understood as just one area of intervention in a more complex field of political relations. The question of how to build and sustain a democratizing school is no less difficult than the question of how to build and sustain a democratic polity. The critical point is to realize that the two questions are inseparable. Adapted from Perspectives on Politics . Sarah K. Bruch is assistant professor in the Department of Sociology, University of Iowa. Joe Soss is Cowles Professor for the Study of Public Service in the Humphrey School of Public Affairs, University of Minnesota.